I grew up tent camping…in the woods behind our house, on trips with friends, on college field trips and more and have always loved it. After Boone and I took our first camping trip together, due to his bad back, he was in quite a bit of pain the next day. Even though we used a good air mattress, I think it was due to the dampness in the night air. So we resigned ourselves to hotels and such when traveling. Flash forward 10 years: With all the great mattresses, ceramic heaters and the amenities of a popup camper, we purchased a used one because I really missed camping and wanted to try to make Boone as comfortable as possible. Well, call me crazy but after having it for a while I got to thinking about how we were laying there in canvas just about snack high for a bear. So, the popup was sold (for a profit, yay!) and we were back to hotels again. Flash forward 2 more years: Due to a very disturbing bed bug incident at a hotel, we put camping back on the table. Knowing that we were going to pay in full and not wanting to put a lot of money into one until we decided it would work for us, I started hunting for a good used camper within our price range. The criteria was it had to be a gooseneck or 5th wheel as Boone is very experienced pulling those, under 20 ft., comfortable sleeping, and a bathroom. After looking for 4 months, I still couldn’t find anything that met our criteria! Going to town one day, I passed a farm in our area and noticed it had a small 5th wheel camper sitting in front of the barn that was exactly what we were looking for. I told Boone about it and he said he would ask the owner (we knew him) even though it didn’t have a For Sale sign on it. Well, it took the owner about a month of thinking about it but he decided to sell to us. 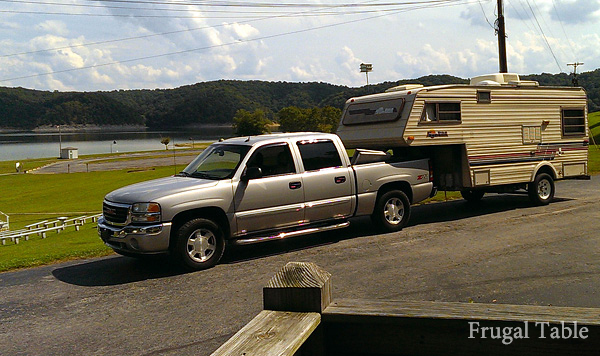 He really needed a larger camper to accommodate all of his grandkids so we motivated him to make that move. 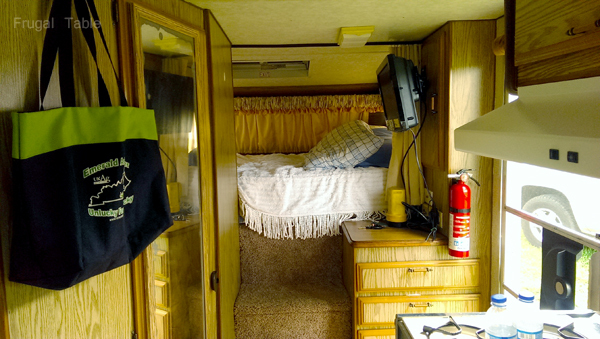 We hauled the camper home (a whole 1 ½ miles) and while it is in really good shape it is somewhat dated as it looks to be mostly in original condition. I decided not to put one dime into updates until we camped in it and determined whether we would keep it or resell. The previous owner had put in a small flat screen TV and a new water heater so those were 2 less items to worry about. I plugged in the camper at our house to be sure all the lights were working inside and out and went through everything just to get familiar with it. There was a lot of researching online all about camping in travel trailers but I still didn’t understand all the ins/outs of the gray and black tanks, etc. Luckily, we have good friends that own their own RV’s and use them a lot. They had an upcoming campout planned at the KY Green River State Park and invited us to join them so they would show us the ropes. There would be 6 of us going in 3 campers. Boone and I met up with our friends and followed them down to the state park, about 1 ½ hours away. Our camper is so light the only time we could feel it behind us was when the electric brake kicked in. It towed like a champ and setting up was easy. We had leveled it at the house so we were practiced in that. We had to borrow an electric cord from one of our buddies because we only had a 30ft. one with us and it wouldn’t reach the service at our site. We thought the camper cord extended to only 6 inches or so when pulled out but it actually extends to about 10 feet. Who knew? Tip #1: Carry an extra electric cord just in case because at some campgrounds you will actually need two. Water hookup was easy. The camper water heater is all propane and with a bath house right up the hill from where we were camping we opted not to use it. After getting all set up, we realized we had parked in the middle of the paved site driveway and when we extended the steps we were stepping off into grass. Not that big a deal but it could be muddy if it had been raining. Tip #2: Park offset to the far side of the drive so you are stepping off onto pavement. At the house, I tried the TV out and got all kinds of channels. Nice, but we weren’t really planning on using the TV much. Sure enough, the first night we camped it drizzled rain a bit so we all went to our respective campers to ride it out. We couldn’t get any channels at all! Turns out, when you travel you have to reprogram the TV and do a search for the local channels. We use satellite TV at the house so it never occurred to me that was the issue. Tip #3 – Conduct channel search on TV to bring in local channels. During the brief rain, I decided to blow up the air mattress and make the bed. Oh my god, that was a feat for which I was unprepared. Because the sleeping area is a loft, you cannot get around to the other side of the mattress. After I had it blown up and had the foam pad on top of it, I had to hold a corner of the fitted sheet, make sure I had plenty of sheet loose below it since I was kneeling on it and basically flop across the bed to reach the far corner and wrestle the sheet on that corner. Repeat on the other 2 corners that were hard to reach and the last one by the open steps was easy. With the top sheet and coverlet, I decided to sit in the bed and arrange them around me. Claustrophobia occasionally hits Boone so we planned on sleeping in the bed backwards with our heads at the steps which made all the tucking in on all the sides that were hard to reach. I was sweating by the time I was done. Tip #4: I am going to try to partially blow up the air mattress, put foam topper on, put the fitted sheet on, and then finish blowing all the way up to see if that will be easier. The camper was plugged in the night before we left so we turned the refrigerator on to start cooling down. The next morning we loaded up the camper and frig. This is a small frig so every time we opened the door to grab a drink, we were sucking the cold air out and it starting getting a bit too warm. I had put thermometers in the freezer and frig so we had to stay out of it until it got good and cold again. Tip #5: Pack a small cooler just for drinks. We also learned to not sit straight up in bed. 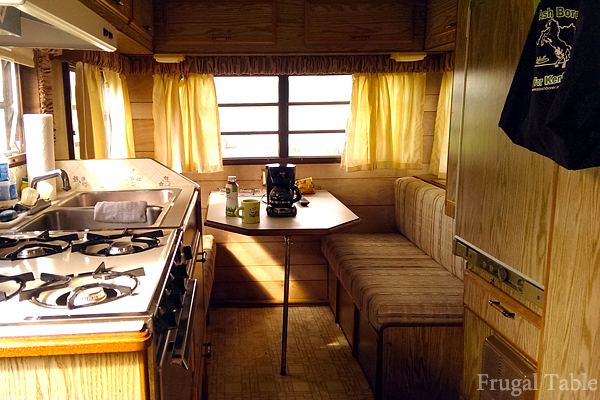 Keep a flashlight handy as the camper gets cold really quick so waking up to adjust the A/C or heat is a must. Be careful on the carpeted loft steps because you can shoot right down them if you are wearing socks. All in all it was a great trip. The camper did great, we slept great, Boone’s back didn’t hurt the next morning, had a blast with our friends and are ready to go again. With lambing season coming up we don’t know when that will be but hope to sneak away for a least a weekend soon. Now that we know it suits us, I am ready to do some updating.